To mark the Kingdom of Eswatini’s 50th Independence Anniversary (Golden Jubilee) and His Majesty King Mswati III ‘s birthday, the Central Bank of Swaziland produced a E5 commemorative coin. These coins are now legal tender in the Kingdom. 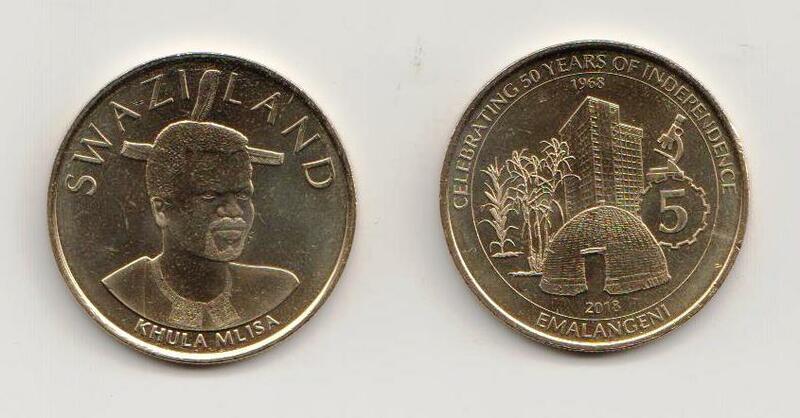 The coins were designed by one Mlando Motsa, a 14 year-old pupil from Mhlatane High school. 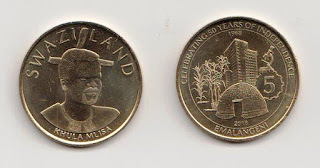 The limited edition coins have a hut, maize and a long story building at the reverse side and is written “Celebrating 50 years of Independence “. The other side of the coin has His Majesty King Mswati III’s and is written Swaziland and Khula Mlisa. Swaziland held an official 50/50 celebration on the 19th of April at the Mavuso Sports Center where the King surprised by the nation by announcing that Swaziland will know be known as the Kingdom of ESwaziti. “Raxcard” has opened new ways for its valuable customers. bitcoin atm card holders can easily exchange their money by Rax Atm Debit Card. Using this card you can easily cash out funds by using any local ATM. The amount of cash will depend upon the current rate of bitcoin. Imagine buying a bitcoin at a certain rate and then withdrawing it on a double rate. You land on the premier website. Yes, you can buy Top up phone with bitcoin easily use cryptocurrency to recharge mobile credits any where in the world.